At SG Tanks we always strive to exceed our customer’s expectations and to provide the best possible service. We are always interested to receive feedback on the work we carry out are always proud to receive reviews from satisfied customers. Take a look below at some of the great reviews we have received after recent tank installations and more. Arrived early which was nice. Professional, friendly guys who seemed honest and trustworthy. Would highly recommend! Many thanks! Quick, clean, efficient and friendly. 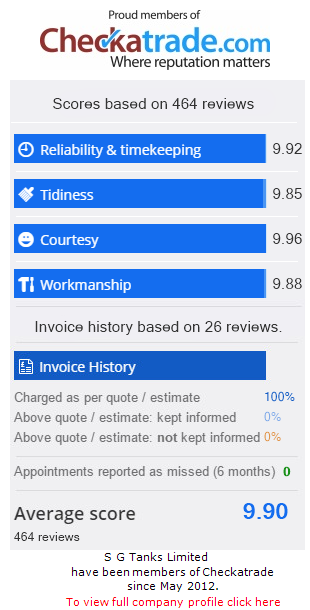 If you are interested in writing a testimonial or providing feedback on any work we have carried out, do not hesitate to visit our Checkatrade profile where you can leave a review. Alternatively, you can get in touch with us by phone on 01903 856403 and speak to a member of our friendly team.